First, they released that dispenser that made it look like you were pulling Scotch tape from C-3PO’s crotch, and I did nothing, because I thought that was pretty funny. Then they released the Darth Vader Burger, and I did nothing, because that was in France and they have weird attitudes towards fast food in general over there. Then Cover Girl announced its Star Wars makeup line, and I was like hey man, that’s not weird at all, don’t be sexist. 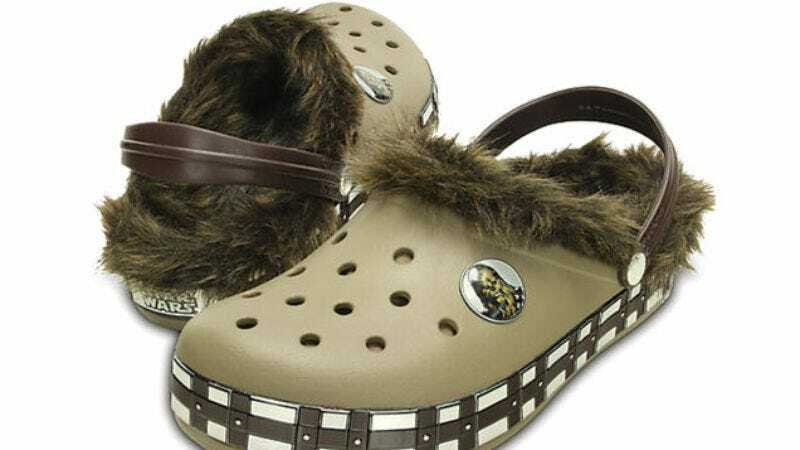 Should you decide to commit a reckless act of aesthetic warfare by buying these things, the Crocband™ Star Wars™ Chewbacca™ Lined Clog (that’s a lot of trademarks right there) is available in men’s and women’s sizes up to a size 13 and retails for $59.99.